What Are Dental Implants in 75229 Made Of? Dental implants in 75229 are a unique tooth replacement method because they bond with the jawbone. In effect, they become part of your oral and facial structure; this enables them to provide the strongest, longest-lasting base possible for your new smile. Before you commit to this treatment, however, you might be curious to learn exactly what it is that you’re inviting into your body. Let’s talk about the materials that compose these remarkable little dental devices. Implants can be divided into a few different parts. There are the implants themselves, which get placed within the jawbone; there are the abutments, which attach the implants to the replacement teeth; and there are the restorations, which are the artificial teeth that go on top of the implants. The most common material for implants and abutments is a titanium alloy. Most dentists it because of its remarkable biocompatibility. Very few people are allergic to it, and it bonds well with tissues in the human body. Therefore, your jawbone is very likely to be able to attach to it and grow around it, locking it firmly in place. 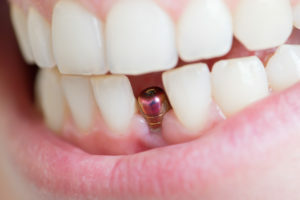 Titanium implants also extremely strong, lightweight, and non-corrosive. When they’re properly cared for, they can last a lifetime. Of course, there are some rare instances where a patient cannot receive titanium implants. Zirconia implants are made of a ceramic material, which makes them ideal for folks who are very sensitive to metals. Although they are not quite as strong as their titanium counterparts, they can still provide a sturdy base for a renewed smile. Acrylic and porcelain are the most common materials for implant restorations. Porcelain is very strong and can last for a decade or longer. It also provides outstanding aesthetic benefits. Since it comes in a wide range of colors, your dentist can help you choose a shade that matches the teeth around your restoration. It even reflects light in a manner that is similar to natural tooth enamel, so once a porcelain implant restoration is in place, it is virtually unnoticeable. Acrylic replacement teeth can also look very natural. This material is a bit softer than porcelain, so it does not last as long. However, it is often better than porcelain for individuals who are missing just a few teeth because porcelain is so hard that it can cause premature wear and tear on the teeth opposite it. Your dentist will carefully evaluate your mouth and talk to you about the pros and cons of both porcelain and acrylic restorations. You’ll be able to confidently choose the one that is best for your unique circumstances. Thanks to the high-quality materials used in dental implants, your new smile is likely to look great, work well with your body, and last for many years! Dr. Hodong Kwon is a general dentist who has devoted much time to learning the art and science of implant restoration. If you have questions about dental implants or would like to speak to him about any other oral health concerns, contact our office at 214-350-8608. Comments Off on What Are Dental Implants in 75229 Made Of?